SALISBURY, Md. 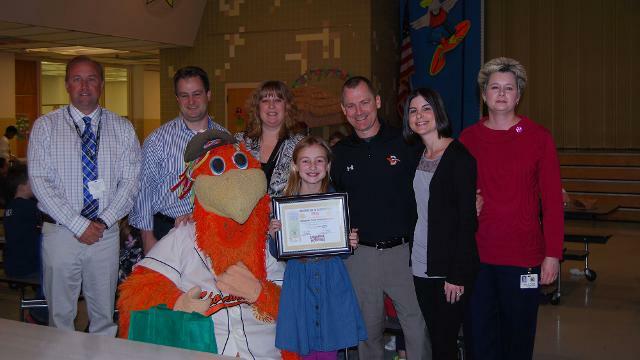 - The Delmarva Shorebirds, class "A" affiliate of the Baltimore Orioles and Dr. James M. Crouse at The Brace Place, presenting sponsor of the Hit the Books program, honored Emily Sandt of Berlin Intermediate School for winning the 2015 Hit the Books Bookmark Design Contest. Her winning design was distributed to all participating students on the Delmarva Peninsula. The Hit the Books initiative officially kicks off January 20 and will continue through February 27. The program encourages elementary and middle school students on the Delmarva Peninsula to read outside of their regular classroom assignments. Students that complete their reading goals receive two free tickets to a Shorebirds home game during the 2015 season. Sandt's winning design featured a drawing of Sherman the Shorebird on a baseball field with airplanes flying overhead encouraging students to "Read, Read, Read." "Her design perfectly illustrated the goal of the program, to get students to read beyond the classroom," said Shawn Schoolcraft, Director of Marketing and Community Relations. "We look forward to seeing the kids realize the fruits of their labor at Arthur W. Perdue Stadium this spring." In 2015, over 40,000 students from over 100 local schools are participating in the "Hit The Books" program, which is the largest non-school funded reading program on the Delmarva Peninsula. "Reading books is a favorite pastime of mine and I love to see young people reading books," said Dr. James M. Crouse at The Brace Place. "Our sponsorship of the Shorebirds 'Hit the Books' program is a perfect fit for us at The Brace Place." Participating schools will be notified in March about their game date at Arthur W. Perdue Stadium, and students will be honored as part of a pregame parade around the field. For more information, contact the Delmarva Shorebirds at 410-219-3112. Season ticket and group outing packages are currently on sale for the 2015 season. The Shorebirds offer full season tickets, half season tickets, a 22-game plan and a 12-game plan along with a number of opportunities for groups to enjoy a night out at the ballpark. To secure your seat(s), call 410-219-3112. The Delmarva Shorebirds are the Class "A" Affiliate of the Baltimore Orioles. The Shorebirds are owned by 7th Inning Stretch, L.P., the same company that owns the Stockton Ports of the California League and the Everett AquaSox of the Northwest League. In 2014, 212,012 fans came to Shorebirds games. The Shorebirds were the proud hosts of the 2011 South Atlantic League "Strike Out Hunger" All-Star Game presented by Perdue that drew 7,410 fans. The Shorebirds celebrated 19-years of professional baseball on the Eastern Shore in 2014. During the 2009 season, the Shorebirds finished with an average attendance of 3,567 fans, the largest average since the 2002 season. In 2007, The Shorebirds had the top attendance based on market size in Minor League Baseball(tm), according to Sports Business Journal (Aug. 2008). In 2010, more than 6,000 fans packed Arthur W. Perdue Stadium nine times including a season high of 8,993 fans on August 7th. In 2014, the Shorebirds welcomed 16 crowds of over 5,000 fans. The Shorebirds were established in 1996 by an investor team headed by legendary chicken company owner, the late Frank Perdue. The Shorebirds have called Arthur W. Perdue home ever since. For more information about the Delmarva Shorebirds call 410-219-3112 or visit www.theshorebirds.com.